The world is changing before our eyes, from passionate calls for adjustments to an extremely flawed system of government, to a growing acceptance and representation of people from more diverse backgrounds. More than ever, people are responding extraordinarily to films and shows with casts and crews that are not just the typical white heterosexual figure; take for instance the unbelievable (and still on-going) box office phenomenon that is Black Panther, and the increasing number of LGBT-friendly movies in mainstream cinema, some of which have gone on to be nominated for (and in Moonlight’s case, even win) Best Picture as well as a few other Oscars. However, one area that many critics are complaining isn’t being explored enough in film, or at least represented as accurately as possible, is the transgender identity, with many quick to point out that barely any actors of trans nature are actually being cast in those kinds of roles on screen (in recent memory, I remember there was a minor uproar about how Eddie Redmayne’s casting in The Danish Girl was something of a direct middle-finger to the actual trans actors who were better suited for the role – personally, I was more concerned with how the movie on a whole was pretty forgettable). 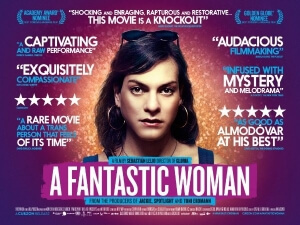 Perhaps that is partly why Sebastián Lelio’s new film A Fantastic Woman is gaining the traction that it has been, because not only does it feature a trans actor in the form of Daniela Vega in the lead role, but more than other similar films that spring to mind it also represents the trans community as real as it possibly can, even though sometimes it can be very tough to stomach. It is also a very well-made and fascinatingly told movie that makes it a must-see for those desiring a more fruitful representation of the LGBT community, with emphasis on the “T”. Vega plays Marina Vidal, a trans woman who moonlights as a singer and works as a waitress during the day. Her main bright spot in life is her much older lover Orlando (Francisco Reyes), but one night everything changes when Orlando wakes up with chest pains, and dies shortly after arriving at the hospital. Things only get worse from there, as she is immediately suspected of violence towards him on account of the bruises and bleeding discovered on him upon arrival (in reality, Orlando merely fell down the stairs in their apartment building), and is cruelly and sometimes violently ostracised by Orlando’s family, who see her existence as nothing more than a perversion and ban her from even attending his funeral. In light of this pretty horrific treatment by the majority of those around her, including the seemingly sympathetic police detective who orchestrates a humiliating physical examination on her complete with a condescending physician who photographs her like she’s posing for a mug shot, Marina attempts to press on and find a way to say goodbye to the man she loved. While not exactly plot-driven, it is much more fixated on what the focus should be on; the lead character, and Vega’s hauntingly beautiful performance. The moment we first see her, we can tell that there is a hint of uncertainty in her eyes, although her confidence in who she is never seems to be in doubt; the uncertainty comes from a feeling of how the rest of the world potentially sees her, with her love for Orlando seemingly reaffirming that spark of hope she so desperately needs. Sadly, after he dies, that uncertainty comes back in full force, and over the course of the film we see her just be subjugated to abuse and segregation that can be very tough to stomach, including and especially one scene where members of her lover’s family abduct her off the street and decorate tape across her head all while screaming homophobic slurs right in her ear. How she doesn’t ever seem to have an on-screen meltdown from all of this is a testament to how strong-willed she is written and especially acted, and Vega not only gets us all on her side in an extremely sympathetic display of grief and persecution, but she clearly has a strong enough screen presence that make even the most minute of her facial expressions say far more than words ever could. Vega is undoubtedly the MVP of the movie, but Leilo has also crafted a very sombre and certainly timely film that isn’t afraid to show the hardships of being a person in this situation, almost as much as the benefits. Leilo niftily mixes fantasy with reality as a deliberate juxtaposition of the campy mindset next to hard-hitting reality; visions of Orlando’s ghost show up in numerous scenes to add a faux sense of supernatural goings-on, and a scene in a nightclub suddenly transforms into a glittery dance number that’s immediately followed by a smash-cut to her walking home in the pouring rain. Sometimes the two form a whole in the same scene, particularly when Marina faces perhaps her most humiliating challenge yet as she ventures through both gender-orientated areas of a sauna to get to her latest goal, as the neon-drenched cinematography and definitely the tight and often suspenseful direction make you feel just as on edge as she is during that scene, all while hoping that this unnerving situation is more fantasy than reality (though it’s clear which one it most definitely is). This is a very strong movie, both from a filmmaking perspective and due to how extraordinary and fearless Vega is in the main role; it may not be entirely fantastic, but this is certainly a film that’s nothing short of exemplary. A Fantastic Woman is an insightful and often hard to stomach look at the persecution of transgender people in harsh communities, all led by strong direction by Sebastián Lelio and a magnificent lead performance by Daniela Vega.